I saw here recently the video with Mike DeGruy and the amazing ocean in the ocean and started digging around trying to find some connections and more information. Obviously they keep claiming it's just high salinity or 'brine' - but if that were the case, could we not keep adding salt to water to achieve the same effect in an aquarium? I've personally ran across a salt production 'brind pond' and while it does have more buoyancy, it certainly doesn't stop you splashing it and breaking its surface tension (much like the Dead Sea). How much salt/salinty would you need to stop the weight of the submersible Mike DeGruy (or the crew in the other video) were in? "Physical properties to distinguish water from heavy water: Heavy water is 10.6% denser than ordinary water." And if we look at the other thread regarding the authenticity of atomic bombs, we can quite clearly see faked footage. So if atomic bombs are fake, and you need heavy water to make an atomic bomb, what sort of conclusion can we come to? Perhaps that the powers to be do not want anyone outside the regulated industries to get their hands on heavy water? They also say Hitler was trying to get his hands on heavy water for atomic uses as well, perhaps another reason? According to the Institute for Energy and Environmental Research report in 1996 about the U.S. Department of Energy, only 225 kg (496 lb) of tritium has been produced in the United States since 1955. Since it continually decays into helium-3, the total amount remaining was about 75 kg (165 lb) at the time of the report. If anyone has seen Dr Judy Wood's videos regarding 9/11, she shows the dust cloud from the collapsing towers rising upwards and never moving too far outwards (I suggest watching the video). So if tritium was present (which she showed it was), it would have been decaying into helium-3, which we all know helium is very light, pop it in a balloon and it rises. Could this have been the reason why the dust was rising? 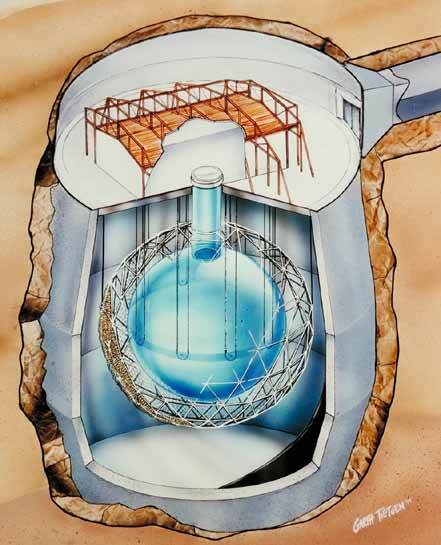 The Sudbury Neutrino Observatory (SNO), shown in the artist's conception above, was built 6,800 feet underground in a working nickel mine in Ontario, Canada. 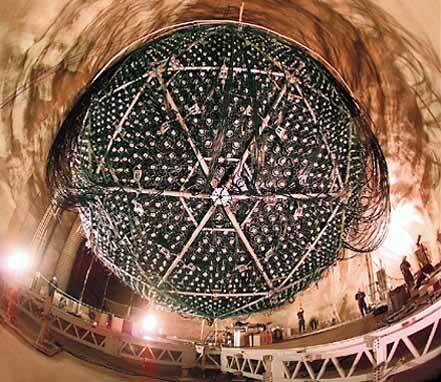 The detector is immersed in light (normal) water within a 10-story-high barrel-shaped rock cavity. Located in the deepest part of the mine, the overburden of rock shields the detector from cosmic rays. SNO can be thought of as a type of telescope, though it bears little resemblance to the image most of us associate with that word. It consists of an 18-meter-wide stainless steel geodesic sphere inside of which is an acrylic vessel filled with 1,000 tons of heavy water (deuterium oxide). Honeycombing the sphere are 9,522 ultra-sensitive light-sensors called photomultiplier tubes. When neutrinos passing through the heavy water interact with deuterium nuclei, faint flashes of light, called Cerenkov radiation, are emitted. The photomultiplier tubes detect these light flashes and convert them into electronic signals that scientists can analyze. * Seems to be a big correlation between heavy water/tritium and energy production? * Could the biblical accounts be correct, there are only 10,000 stars? * Could nuclear plants actually be getting most of their energy from the heavy water reaction? rather than the "nuclear fuel"? * The atomic bomb was meant to be the heavy water/tritium bomb, but they failed and faked it? * Perhaps such such a technology was used on 9/11, and Dr Judy Wood is not far off the mark? * Biblical/Alchemy connection, Deuterium, Tritium.. Deuteronomy, Trinity? Perhaps the original "bible" once was the book of complete "science", the Astronomy chapters of the Ethiopic Book of Enoch show this too. * Could the SNO/neutrino observatories be capturing the star light and watching its reaction with the heavy water? splitting it into the separate sensors? So there we go - I know it's not really related to flat earth, but personally I had never heard of tritium until a couple of weeks ago, and heavy water until tonight when I tried to find an explanation for Mike DeGruy's experience with the underwater ocean. I'll leave it here, but very interested to see what other people think! I would hazard to guess this is only really the "allied" side of the story, however it does illuminate the fact that it's not very well know. You have done a lot of very interesting research, and I agree with your conclusions. It would definitely make sense for them to try and hide this 'Heavy Water' from us, especially if it did have energy producing qualities. By using the Nuclear Fraud to keep it from us, they stop us from understanding and making use of it. It does seem very possible to me that it is used to create the 'Nuclear' energy, and that it was used on 9/11. It is especially interesting that it involves the same substance that Judy Wood has proven was found at the site. I also agree that it seems very likely that we only have the 10,000 stars that can be seen by the human eye, and that special telescope that you mentioned did seem to prove the Bible right on that issue. Despite the fact that much of the Bible is nonsense, it definitely does contain a lot of good information, because it took from so many ancient parables/sources. "Its hypothetical existence was first proposed in 1934 by the Australian nuclear physicist Mark Oliphant while he was working at the University of Cambridge Cavendish Laboratory." "Oliphant had performed experiments in which fast deuterons collided with deuteron targets"
The current theory floating around in my mind is that it's just naturally forming helium from the ocean floor/under earths crust (perhaps a naturally occuring reaction with heavy water in the depths? ), floating up and heading towards the "firmament" or into the sky if you wish (but not into "Outer Space" as they say). Then instead of it being "embedded in the upper layer of regolith by the solar wind over billions of years" it just keeps on floating up there and being pushed around by the winds - all speculation of course, but I'll keep digging around to see what I can find. They also say they "deliberately produce it in nuclear reactors", but as per my speculation - it's most likely just a bi-product from the decaying tritium produced from the heavy water reaction. Maybe they are just throwing uranium in the mix to scare people away from studying the actual science behind these reactors? Also I find it quite amusing that they state this "helium-3" can just "float into outer space", why does our atmosphere not just float into outer space too? Why can't they just float a "shuttle" up with some big helium balloons instead of using their big fake rockets? So many contradictions in their science, it's laughable. We can observe this too (tritium vials, watch faces, etc), so light + tritium = enough energy to produce the glowing green light we see. Even the SNO experiments linked above indicate this "When neutrinos passing through the heavy water interact with deuterium nuclei, faint flashes of light, called Cerenkov radiation, are emitted". I'll try formulate something a little more complete when I find the time. discovery, Urey and others produced samples of "heavy water" in which the deuterium had been highly concentrated." Most certainly, there is an obvious large fabrication of "science" on top of "heavy water" but I believe there is still something valid underneath it all - remembering what started my search here was the Mike DeGruy discovery of the underwater ocean, which appears to have completely different properties to "brine lakes" or "brine ponds"! Peeling back the onion, layer by layer! there is an obvious large fabrication of "science"
which appears to have completely different properties to "brine lakes" or "brine ponds"! Have we seen "brine water" under compression? Both good questions, in Mike DeGruys clip narrated by David Attenborough, David claims "half a mile down, bottom of gulf of mexico". David Attenboroguh claims they knew about these in the 1990's - and it looks like Mike is one of the few people to actually see them. Personally, Mike's enthusiam seems genuine to me. In regards to "brine water under compression", it could well be the case. David Attenborough, claims "half a mile down, bottom of gulf of mexico". for the pool of water shown, one half mile deep, which looks to be denser than surrounding water. Thx for the video reference. If the substance at sea bed was being formed there, wouldn't you expect a transitional layer? The separation is quite distinct. Urea - a white water-soluble crystalline compound with a saline taste and often an odour of ammonia, produced by protein metabolism and excreted in urine. A synthetic form is used as a fertilizer, animal feed, and in the manufacture of synthetic resins. Formula: CO(NH2)2. It does seem to have a "primordial" meaning in most context you see it in. The Icelandic word for "rain" and the Old English for "aurochs" go back to two different Proto-Germanic words, *ūruz and *ūrą (although possibly from the same root). I'm formulating some other ideas too, I'll update the post tomorrow! using is correct. My reference is the word ‘sure’ when said the way the Omani’s say the town name of Sur. And now you have me interested in learning about runes, but heck I must go back to study of the moon device because I don't know where I live yet! "Now that heavy water is cheaper, animals have been given it as their sole drink." "They die within a week." "Their eyes protrude, their hair stands on end, and they die' of "artificial fright." Thats right ladies and gentlemen, Heavy Water will Scare you to Death. 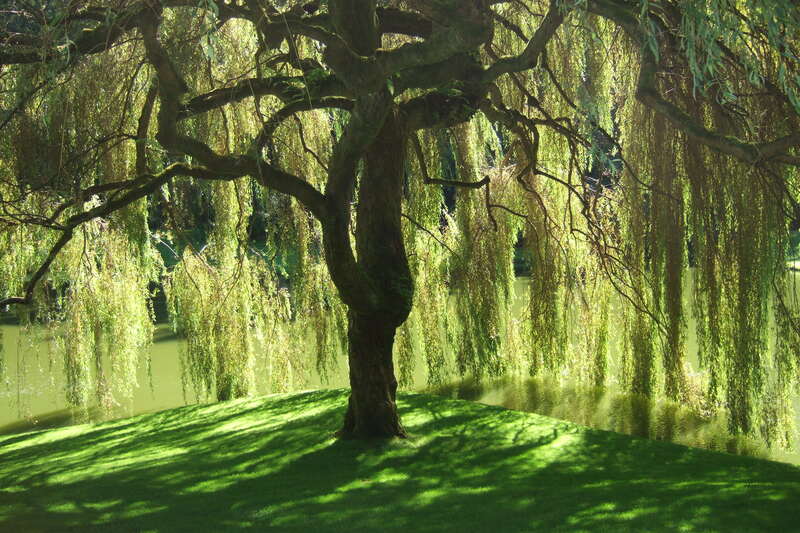 Nothing grows under the "Weeping Willow Tree". "This mystery has puzzled the world for untold years. It is solved at last, says the London "Daily Express." "When the ever-mourning tree weeps it sheds tears of "heavy water" - tears of death to everything on which they fall." Sorry schpankme, I didn't see your post til just now! All that poor dead grass under the Willow Tree! Just learned about this stuff called primary water. Another way of enslaving us by not telling us about the replenishing water in "consolidated rock fissure waters". It is fascinating and been around for a long time. Been lying to us about the hydrological cycle as being the only source of water and this is what gives us rivers and perpetual waterfalls etc. This is bunk. There is a unique cycle beneath the earth that produces endless pure, pristine waters. This would be your springs etc. Read: New Water for a Thirsty World written in 1960 with a foreward from Aldous Huxley. Author is Michael Salzman. Also listen to interview with Dr. Stephan Riess on YouTube. He is an amazing man who knows all about this and has most of his life. He even had a primary water well at his house in dry California area to prove to all. He also drilled 72 wells around the world with 70 being successful. The flow rate on these is tremendous. Needless to say this info has been intentionally squelched. Surface water and aquifers are what we tap into now. There could be primary water wells around the world for everyone. Endless supply. There is already one in Israel, Saudi Arabia, Africa, etc. They were drilled decades ago. Everyone needs to learn about this because as they continue their nefarious agenda in California with drought, and try to take this who knows where, we can hopefully make enough fuss about primary water. Once again divide and conquer applies here. Hydrologists and geologists are kept apart. Of course many were bought off to keep the secret. I still have a lot to learn but this is another big piece of the grand scheme of things. Please let me know if anyone uncovers more info on this topic. this is not about primary water but about water distillation, i found no fitting thread, sorry about of topic. Perfect argument as to why Distilled Water is not only good for you but the best!. so, who wants diarrhea, and who wants cancer? clean water dont even conduct electricity. only thing in this video i dont agree with is that you should buy a distiller. its simple to build youre own. heres 4 ways to do it so you can get the idea of how it works. however i think you should probly be carefull on what materials you use, im no expert but i think glass is recomended, but i will probly use stainless steel. i wouldnt feel safe with copper or aluminium or plastic like used in the video. this is the best idea i found. i recomend you all to take a pot and fill it with water and let the water boil away, when all the water is gone you will see what was in the water. i never want to drink tap water again. truthplease wrote: There could be primary water wells around the world for everyone. Endless supply. there already is endless supply of water in the world if you know how to clean it. salt water or even swamp water is drinkable if distilled. im gonna assume this primary water has rocks and stuff in it that youre body cant absorb and this will instead get stuck in youre body. they call it minerals, but youre body obviously want bioligical minerals and not rocks. they say distilled water is slightly acidic, but this is how nature cleans water, and what life gets from nature. its safe for all plants and animals, so i doubt its harmfull for humans. rain water is distilled water. I have just watched this video on primary water and how the govt of USA and Rothschilds have been manipulating the water supply for decades and longer. The Executive Order 13514 mentioned in this video, signed by Obama is here for download. I am not entirely certain that rain water is distilled water. There are plenty of examples of smoke, pollution, dust and even salt in the air that would foul rain water as it condensates and falls to the flat Earth. I do agree that nature has some reasonable means of cleaning water, such as groundwater diffusing through porous rock. i agree, but the question then is how much it collects on the way up, and while in the clouds, cause on the way down you just need to wait for the first few minutes of rain to clean out the air before collecting it. I would still trust the rain water more then ground water tho. Thanks for showing intrest, its an important topic. I would like to suggest that we use this thread (or a diferent if thats beter) to discus all types of drinking waters. I would be very interested to hear what other ppl do to have clean and safe water. Is this possible? And if so, what do you guys drink?